trusted brands at affordable prices. Richmond Business Furniture (formerly Reconditioned Business Furniture) is committed to bringing you custom office solutions to fit your budget, whether you are a small start-up or an existing large scale business. We are a full service office furniture dealer offering new and used name brand products. We are dedicated to creating ideal work environments for our clients. 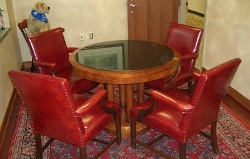 Richmond Business Furniture is family owned and operated with over 20 years of experience in the industry. And, we are eVA/SWaM certified in the Commonwealth of Virginia. 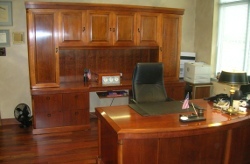 We buy and sell top quality used solid wood desks, chairs, filing cabinets, conference tables, and cubicle systems. We also buy and sell office furniture from some of the top name brands in the industry: Baker, Devon Office, Haworth, Herman Miller, HON, Jofco, Kimball, and Steelcase. View our virtual catalog for new office furniture available for quick ship, or view our Products page for some of our in-stock items. All prices listed in the virtual catalog are manufacturer's list price. Please call us today at (804) 230-5990 to inquire about *your discounted price*!. As a full service dealer we can put together a complete package using a mix of new and used office furniture, and can offer delivery and installation service as well. If you have any quality office furniture you need to liquidate, give us a call! Fancy furniture without the fancy prices and overhead! Check out a small sampling of our Products or stop by our solution center at 6130 Midlothian Turnpike, 1 mile east of Chippenham Parkway in Richmond, VA.
Or call (804) 230-5990 for an appointment convenient to your schedule!